The Group hosted our second Family Quiz Night on Saturday March 30th. This proved to be as successful as last year, with 84 people attending and enjoying a fun evening of chips, sausages and questions for both adults and children. The evening raised a tremendous profit of £421. Pegasus Pack held their winter camp in March at Paccar Scout Camp Site at Chalfont Heights. Rather than the usual indoor accommodation used for Winter Camping they used Roy’s enclosure which has some permanently pitched American Tepees. As well as enjoying a different style of camping the Cubs also earned their Cyclist badges with the paths on the campsite being marked out with bags of flour to show the road markings. This was a very successful weekend, helped by the glorious weather and we are already planning to visit the Tepees again! 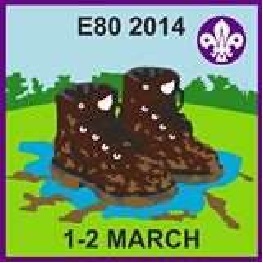 Endurance 80 is a 50 mile (80km) competition hike that takes place each year around the beginning of March. The challenge is to walk the route in 24 hours. Walkers, over the age of 14, are in teams of between 3 and 5 walkers and they carry all their own food and safety equipment with them. There are 22 check points manned by volunteers and the event is very professionally run. First run in 1980, 1st Chesham Bois have a long association with the event, with numerous members of the group taking part, many victories and the course record. So in 2014 we had 6 teams with a total of 23 walkers. Most of the teams had a mix of experienced walkers and some who were entering for the first time. The walk took place on the 1st and 2nd March, the day after very heavy rain fell across the Chilterns which turned the course into one of the muddiest and therefore trickiest any of us could remember. The route starts in Missenden, it runs a huge loop taking in Chesham, Wendover, Coombe Hill, Princes Risborough, Stokenchurch, Bledlow Ridge and Lacey Green. The route is largely off-road and makes little attempt to avoid the steep hills. Congratulations to all those who finished which despite the conditions included several walkers taking part for the first time. Next year’s event takes place on the 7th and 8th of March.